Thanks to Lanaya and Leslie for having me as a co-host! It’s Sunday! ~ Welcome to Week #40 of Raising Imperfection! It’s your favorite post Sunday link party! We can’t wait to see what you’ve been up to during our two week hiatus! I moved to Arizona and Leslie and her mom have been getting busy with a cute dress shop on Etsy! What was your imperfection this week? Please view our very short introduction video for some link party rules and announcements. Be sure to come back for Feature Fridays! Leslie and I choose our favorite links from the link up and feature them!If you missed the last features, you can see them HERE. Please grab our link party button! Be sure to visit Leslie and I for Feature Fridays to see if your post was picked to be featured! Want to be the next co-hosts? Enter the Rafflecopter below and you could win! 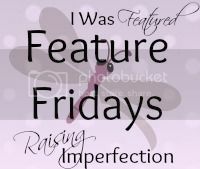 And don’t forget to sign up for the weekly Raising Imperfection link up reminder.